I’ve been a long time fan of Olivia Palermo. Those of you who binged watched “The City” back in 2008 will likely agree with my mini obsession over Olivia’s amazing style. Honestly, I’d probably wear every outfit she wore on the show nearly a decade ago, NOW. When Banana Republic announced the release of the Olivia Palermo collaboration collection, I had a major fan girl moment. The collection released in September, and guys, if I had a bottomless wallet, I’d bring EVERY single item home with me! Red is not typically a colour I gravitate to when it comes to stocking up my everyday wardrobe. To me, perhaps coming from a Chinese upbringing, I’ve always connected red with Chinese New Year or getting married. In our culture, red is a symbol of good luck and celebration, and though I don’t consider myself a ‘traditional’ Chinese girl, I’ve always reserved this very vibrant and happy colour only for special occasions (remember that red Chinese dress from my wedding?!). When LE CHATEAU handpicked this red cashmere-like belted trench coat for me, I was a little intimidated by it. I would have normally picked a safer color, such as the black or camel version but super glad it encouraged me to push my own boundaries by sporting it with a fun twist on business casual. I find it always a challenged to dress appropriately during Fall when the weather hasn’t quite transitioned yet. I’ve stocked my closet up with cozy knits, wool pants, thigh high boots in preparation for the colder weather but looks like Fall just isn’t quite ready to hang around for good yet! But don’t get me wrong, no complaints here! I love that we’re experiencing a heat wave in Toronto which means that there is absolutely no shame when it comes sporting those light pastels a few days longer. In fact, I rarely stick by colour rules when it comes to fashion. Gone are the days of no white after Labour Day and truthfully speaking, I think whites and pastels, especially paired with chunky cozy knits are so yummy during the cooler season. They are so full of love, laugh, and joy, and well, also gives me an excuse to dress up for the occasion! After attending four weddings over the last several weeks, I must say I’ve become a pro at dressing as a wedding guest! First, comfort is key. I mean, let’s face it, there is much eating and dancing to be done after all! And secondly, dressing appropriately for the venue and type of ceremony is also just as important. If you’re attending a backyard garden wedding, you may not want to show up in super high stilettos because I guarantee you’ll have a hard time navigating across the lawn! I’m a sucker for a great floral dress. When I come across one that can double up for work and play, I definite won’t be passing it up. I was a little skeptical of the fit of this LE CHATEAU floral print wrap dress as first, as I thought the cut may be on the conservative side. But after putting it on, I was sold. Seeing that getting the entire family out to Hawaii is likely a once in a lifetime kind of experience, I surprised my sister and mom with matching swimwear and outfits from Joe Fresh’s recent collection in collaboration with lemlem, an artisan-driven collection of women’s, men’s, children’s and home goods made entirely in Africa. Can you believe I’ve never stepped foot onto this location before? For those of you who live in Toronto, Sugar Beach has become a local favourite due to the cute pink umbrellas that stand tall against the city waterfront. Perhaps it was my (almost) all pink outfit that inspired me to visit Sugar Beach on this particular afternoon for an impromptu photo shoot. Not sure about you, but I’ve already started to stock up the closet with new Spring finds!! 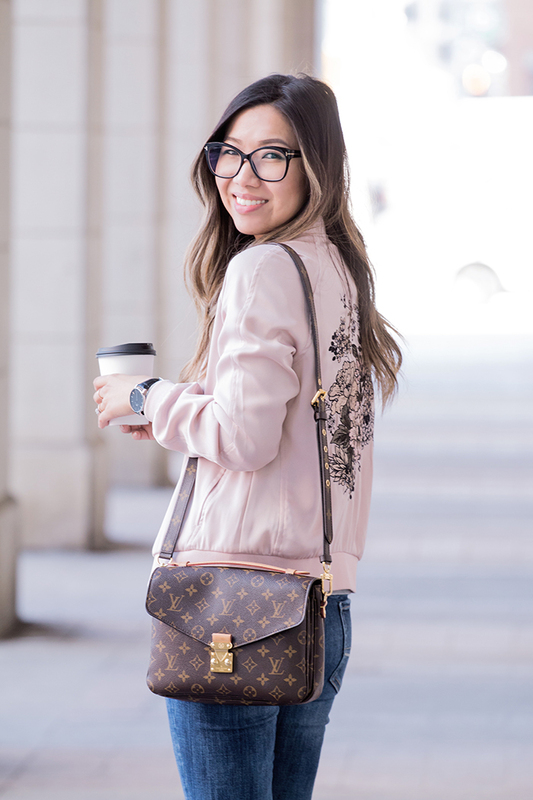 I’m most excited about all the great bomber jackets this season and am especially drawn to floral prints and embroidery lately! The one I’m sporting in this post is from Dynamite’s Spring 2017 collection and I absolutely adore it. To be honest, I can’t remember the last time I shopped at Dynamite, but I have to say I’m deeply impressed.